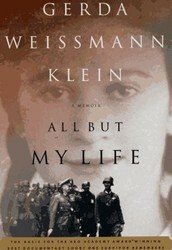 In the Winter of 1945, a young jewish woman named Gerda Weissmann began a death march fro a labor camp to Czechoslovakia... It was more than 300 miles long, and 4,000 other women joined her on the journey. Gerda was one of the few that survived, but being a prisoner of Nazi's from age 18, she had quite the survival story. After having the will power for years to survive under the power of German's, she says that the Nazi's had taken All But Her Life. After being liberated by the 5th Infantry Division of the U.S. one of the American soldiers there was Lieutenant Kurt Klein. After falling in love and getting married, they started a new life in America together. Just before Gerda was about to lose all hope. Part of the book "All But My Life" talks about her younger childhood, her brother and family friend being forced to leave to serve in the army, and never seeing them again. Also, the story behind her parents' deaths. This touching, inspiring byout ook will make you think again about how good we actually have it here, compared to what the Jews went through during the Holocaust. 1) In this book I learned that many Nazi's were ordered to go and take over stores/factories and kill any employees that got in the way. 2) I also learned that when people were on death marches, if any prisoner asked to rest or stopped to rest was shot and killed. 3) Another thing that the book taught me is that at certain concentration camps, the soldiers would line prisoners up and shoot their toes off then force them to keep working. SUGGESTIONS- I think that anybody could like this book if you enjoy a simple, easy read that is non-fiction and inspirational!